Sometimes it’s best to just let the interview do the talking. Introducing … author Mara Rockliff. I don’t know how you’ve done this, with books illustrated by different artists, but it really seems that you can tell when a book is a Mara Rockliff book. And I have a mad crush on the non-didactic make the world a better place message that’s in your picture books and GET REAL: WHAT KIND OF WORLD ARE YOU BUYING? Can you explain what voodoo magic you use to effortlessly brand yourself? Although I never sat down to write about Utopian communities, I think that thread runs through my books. In THE BUSIEST STREET IN TOWN, neighbors unite to tame the noisy cars and trucks that rule their street, transforming Rushmore Boulevard into people-friendly Walker Road. (Apparently my own idea of Utopia involves giant sunflowers, a poodle, gingersnaps, balloons, and a live mariachi band.) In MY HEART WILL NOT SIT DOWN, Kedi’s village comes together to accomplish a good deed she can’t do on her own. 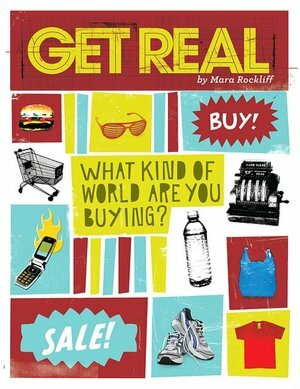 And while GET REAL: WHAT KIND OF WORLD ARE YOU BUYING? might seem to speak to teens as individual consumers, it’s really about protecting local communities and being caring citizens—of our towns, our country, and the world. How did you come up with Kedi’s point of view for telling the story of America’s Great Depression in MY HEART WILL NOT SIT DOWN? Can you also tell us where the title (LOVE the title) came from? “My heart will not sit down” is a wonderful expression that was in use among the Bulu people of southern Cameroon at the time the story is set. When I found it in my research, I thought it perfectly captured the theme of the story, which is about a girl who hears of children going hungry far away in her teacher’s village of New York City and decides she has to find a way to help. The story was inspired by a true event: In 1931, during the Great Depression, the city of New York received a gift of $3.77 for hunger relief from the African country of Cameroon. When I came across a mention of this in a history book, I was immediately fascinated. Even eighty years ago, $3.77 wouldn’t have gone far to feed the hungry of New York. Who were these people who had sent this gift? They couldn’t have known anything about America. They must have had very little money themselves. And yet, when they heard of hungry strangers somewhere in the world, they willingly shared what they had. Nothing more is known about this incident, but with a lot of research (and the generous help of Doris Anderson Reeves, who grew up in Cameroon during the 1930s) I was able to piece together quite a bit about what may have happened. One thing I learned was that the villagers probably heard about the Great Depression from an American teacher. That told me that it could have been a child who first thought of sending money to America. And so Kedi was born—a girl who knew how it felt to be hungry, a girl who had often emptied her bowl without filling her belly. A girl who heard of hungry children far away, and felt her heart would not sit down until she helped. What books did you love fiercely as a young reader? What character would you have wanted for a friend? I loved THE CHRONICLES OF NARNIA, anything by Edward Eager or E. Nesbit, THE GREAT BRAIN and its sequels, the Betsy-Tacey books, the All-of-a-Kind Family books, MANDY, FREAKY FRIDAY, A WRINKLE IN TIME, THE EGYPT GAME…I could go on and on. I loved anything with scrappy orphans and other smart, brave, independent girls: Margaret Thursday in THURSDAY’S CHILD, Claudia in FROM THE MIXED-UP FILES OF MRS. BASIL E. FRANKWEILER, Caddie Woodlawn, Bonnie in THE WOLVES OF WILLOUGHBY CHASE. I’m not sure if I imagined them as friends or just wanted to be them. Can you imagine all those characters together in one room? The fur would really fly! Many years later, I reread the book and I couldn’t believe its heavy-handed preachiness. We always talk about how much kids dislike “books with morals,” but I had never even noticed it. I think kids actually like a bit of moralizing, as long as the story grabs them. Look at the Narnia books. Or the ongoing popularity of the Berenstain Bears. I just did my final tweaks on a picture book that is coming out later this year, ME AND MOMMA AND BIG JOHN. It’s my first picture book for Candlewick and I’m really excited. The story is about a boy whose mother works as an apprentice stonecutter on Big John (the Cathedral of St. John the Divine) in the late 1970s. It’s kind of a meditation on the nature of art, and I guess it’s also really a story about community. Like all the builders of the great cathedrals throughout history, Momma is creating art. She knows her art will never make her famous; people who come to the cathedral won’t even know which stones are hers. At first, this disappoints her son. But when he sees Big John, he understands why she is happy to be part of something bigger—a community of artists who are making something beautiful to last a long, long time. ME AND MOMMA AND BIG JOHN is illustrated by William Low, who does amazing things with space and light. My agent said that when she turned to the page where they enter the cathedral and look up, she gasped and burst into tears. It’s truly breathtaking. I think writing picture books is a little like building a cathedral. My name is on the front, and so is William’s. But really it’s the work of a community—writer, illustrator, agent, editor, designer, and other people I will never even meet—all collaborating to create something that none of us could have managed alone. I somehow think it would be impossible for Mara to do an interview without coming full circle. Thanks so much for taking the time here, Mara! You can learn more about Mara by visiting her website. Please be sure to check back here next week for what could only be called the start of RockStarPalooza. I’ll be celebrating the imminent release of SO YOU WANT TO BE A ROCK STAR with an interview with its divine illustrator, Kirstie Edmunds and a fabulous Rock Star swag giveaway. This entry was posted in Uncategorized and tagged Cameroon, Cathedral of St. John the Divine, collaboration, community, Get Real: What Kind of World Are You Buying?, Mara Rockliff, Me and Momma and Big John, My Heart Will Not Sit Down, Swiss Family Robinson, The Busiest Street in Town, Utopian literature. Bookmark the permalink. Fabulous interview! These books sound incredible and I can’t wait to see that picture book. But I like Mara’s “…like building a cathedral.” Loftier, by a mile. Really interesting interview! Thanks so much!